The foundation grid-work went up on Saturday thanks to 11 guys (Josh Harris, Chris Sabes, Jim Welborn, Jeff Woelhoff, Bill Riphan, Jerry Hedstrom, Bryan Hedstrom, TJ McDaniels, John Bowes, Matt Lockard, Casey Moore). Check out the video to see some of the work. The guys who master-minded the hanging grid-work was Jerry and Bryan Hedstrom - master builders from Topkea. The have an incredible shop just north of Topeka. Also, thanks to my father-in-law, Richard Varner, for pointing me in the right direction with good suggestions of what material to use. Don't forget Derek Taylor and Kevin Beck who were 'on call' just in case we needed the help on Saturday. Appreciate your guys' availability! If you are curious as to what the lights 'might' look like - check out the CAD drawing. Click on it for a larger version. The CAD drawing is the result of hard work by Matt Ottman, our resident electrical engineer. He's also figured out the electrical loading plus distribution. We will need 12 circuits 20 amps each. Matt, thanks so much for using your skills and talents to benefit the body on this one. Thanks for being the brains behind the vision. What about the trees in front of those 2nd story windows? Thanks to Rick Wenger for professional trimming the trees in front of the windows on his own time and when it's the first snow of the year in Topeka, Kansas. Man it's getting cold. Glad I'm toasting inside looking out the window at Rick. Stinks to be you. You'll get an extra set of trimmers in heaven for this one. Went to Walmart again and picked up a few extensions cables (see cart in picture). Then headed over to electronics to pick out a monitoring radio. 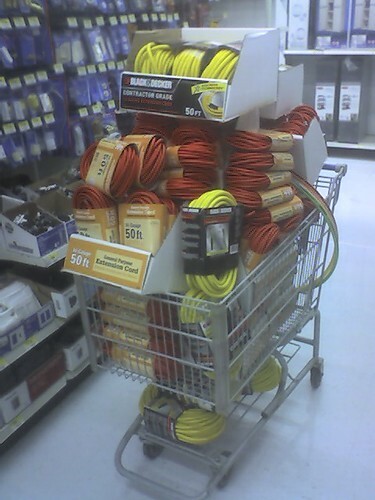 Two gals in electronics helped me with the radio, but asked what in the world I was doing with my cart of cables. I explained. They became so curious that they ASKED ME to return to the store with more information about the light show. They want to come and see it. 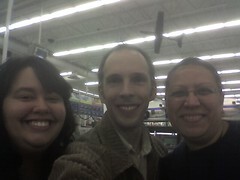 If you go to Walmart - say hello to Francis and Amber. They even checked out my whole cart at the electronics check-out. That was nice! While you are there, please thank Rezaul for loading all the cables into my car. I now have a Target 6 list. Amber and Francis in electronics at Walmart. 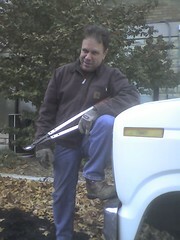 Rezaul with a great attitude loads the car with me. In case you really wanted to know, here's what's on my computer desktop. No pressure. Looky looky what John Crouse made for the light show! He had no manual or plans. He simply engineered them. Way to be innovative John! 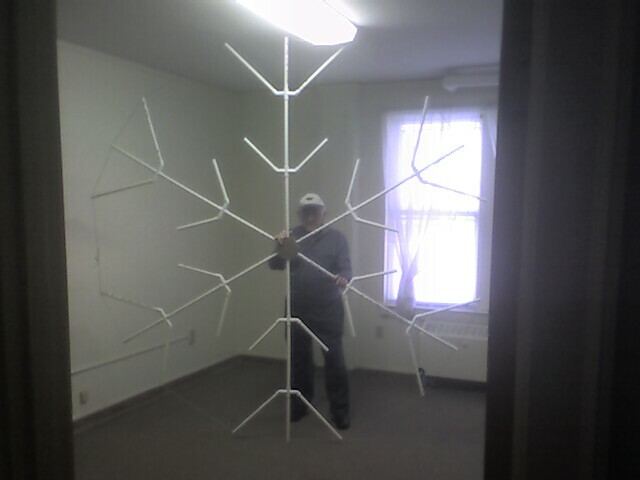 That snowflake is 9' tall. 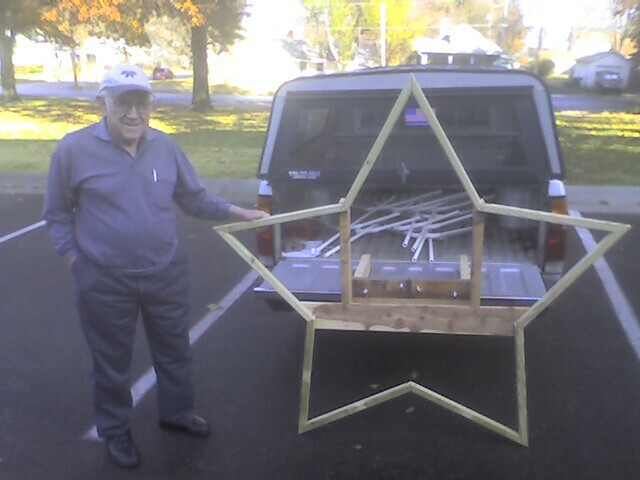 Check out the angles on the star. Those aren't easy to make. 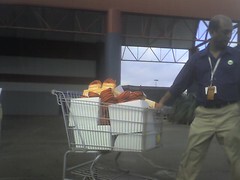 This morning I hit a local store again to pick up some more things for the Christmas light show. While I was there, I thought I'd pick-up some insulation and lawn fertilizer as well. The fertilizer bag had a hole in it and it was dumping out all over my feet. How embarassing! Then I turned around and saw even more tragedy behind me. The fertilizer had left a pretty good trail behind me in every isle that I walked down. "Clean up in isle (throat clear) errr...isle one through twenty." My wife is playing a big behind-the-scenes part in this Christmas event. Not only did she pick up 70+ candy canes from Walmart (previous post), she is also encouraging me to work late and be with the kids herself. Not only is she doing this - she wrote all the keyboard and string parts from the recordings for the light show. I am so grateful that I have a wife who is a part of ministry life - and doesn't want any credit. So I'm giving her credit here. Thanks Lisa, for being a big part in making this come together! So we had our first & last string sectional rehearsal this past Saturday. The parts Lisa transcribed were right on! With a few minor adjustments - the strings will fall into place nicely. Kudos to the strings to playing in Db (kringe) on the one selection. Strings and guitarists hate flat keys - and Db is about as bad as they come. The key will work great for vocal range and the mood the song fills. Looking forward to a great window spectacle from the strings. Those bows will look great in the black light! Yes folks. Walmart is officially cleaned out of them. 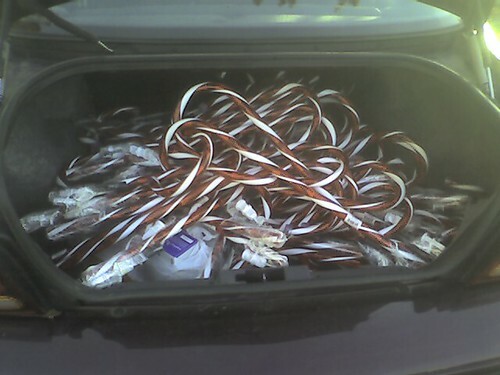 Topekans will not have any candy cane lights this year because we have all 75 of them. Here's a pic of our trunk. Thanks to my beautiful wife for picking them up, getting the strange looks from patrons, and answering people's questions - "what are you doing with those - it's not even Thanksgiving yet." If you missed the Christmas Vision Cast video this past weekend at Topeka Bible Church, then here it is again. It's scary. It's risky. It's gonna be fun. It's gonna be effective. God help us.